Biblical teaching about money is very clear, very consistent, and quite radical. God’s ownership of everything is a foreign concept to most of us. We like to think of our money and our possessions. Yet the Bible makes it clear that God owns everything. All things were created by him and for him (Colossians 1:16). Everything belongs to him. nowhere in the New Testament is there an explicit command to tithe Christians are instructed to give to those who minister (1 Corinthians 16:1; Galatians 2:10). We are to give to those who trust God to supply their needs (Philippians 4:19). We are to give as God has prospered us (1 Corinthians 16:2), and are to give cheerfully (2 Corinthians 9:7). And the Bible teaches that we will ultimately give account of our stewardship (Romans 14:12). We are to give generously. Using an agricultural figure of speech that can be understood today as well as in New Testament times, we are to be generous with money and possessions. Giving benefits everyone. The Bible instructs us in how to give and it also encourages us declaring the benefits of giving. Maybe you have asked yourself the question, why is it better to give than to receive? In 2 Corinthians 9: 6-15 there are benefits declared to those who are charitable. Here are three reasons; it benefits others, it benefits you, and it glorifies God. The Bible says we're pilgrims, strangers, aliens on earth (Hebrews 11:13). We're ambassadors representing our true country (2 Corinthians 5:20). "Our citizenship is in heaven" (Philippians 3:20). We're citizens of "a better country--a heavenly one" (Hebrews 11:16). Where we choose to store our treasures depends largely on where we think our home is. 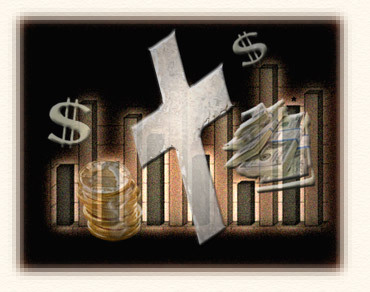 Should The Church Teach Tithing? The Bible has quite a bit to say about money, and a significant part of these financial warnings concern debt. Proverbs 22:7 says, “The rich rule over the poor, and the borrower is a servant to the lender.” When you borrow money and put yourself in debt, you put yourself in a situation where the lender has significant influence over you. Many other verses in Proverbs also warn about the potential danger of debt (Proverbs 1:13-15; 17:18; 22:26-27; 27:13). While this does not mean that we can never be in debt, it does warn us about its dangers. It is deeply alarming that most Christians seem to be blissfully unaware of the fact that the principles of the Word-Faith movement being trumpeted from pulpits across the land, not only stems from the same occult sources as the spiritual movement known as New Thought, but uses exactly the same terminology and techniques. And no wonder.. Christian Science, New Thought, Unity School of Christianity and the Word-Faith movement all have common origins. The non-believing world claims that there are spiritual “laws” which people can learn to use on their behalf, however the Word Faith group, claiming to be Christian, have to somehow “Christianize” the concepts and add God into the mixture. But since the Biblical God does not fit this mold, they completely reinvent Him in an image that conforms to their beliefs, teaching that the power of faith is a force… one that can even twist God's arm.